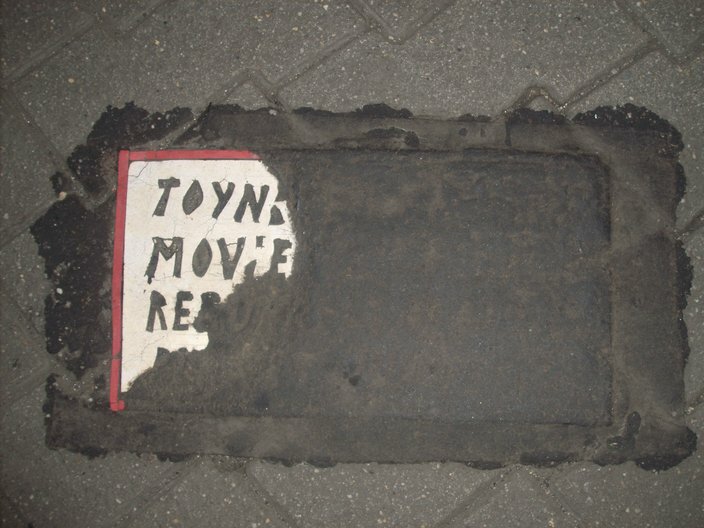 An older Toynbee Tile, found near South Street. 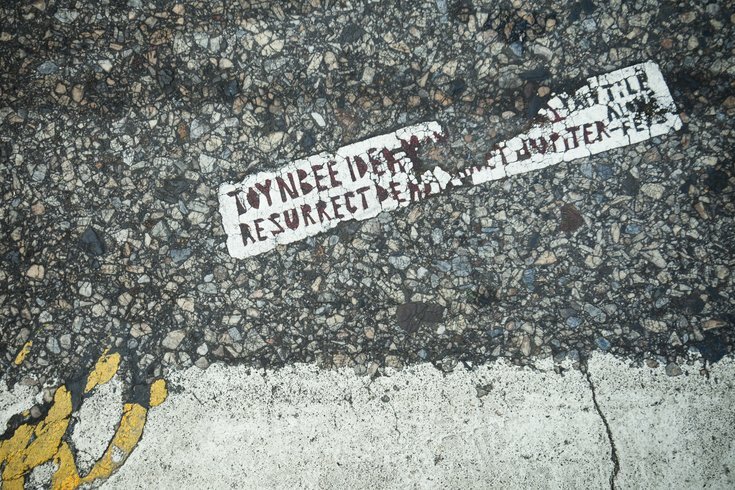 The 2011 documentary “Resurrect Dead” told the world about the Toynbee Tiles, those mysterious tiles stuck to the streets of Philadelphia and a handful of cities around the world. At the center of the movie was Philly artist and musician Justin Duerr — surely the world’s most knowledgeable and enthusiastic expert on the phenomenon. So he was the first person I thought of when, after years without a new sighting, new Toynbee Tiles started showing up in Philly, with sightings in Center City and South Philly. I reached out to Duerr — who’s currently working on a book about insanely fascinating artist Herbert E. Crowley — this weekend. So, new Toynbee Tiles have been turning up. How can we be sure they’re the real deal, made by the original tiler? We shouldn’t say specifically where they are, right? People really come along and steal them for themselves? Several tiles of this new summer batch have been stolen — Fifth and South — and several others have gone missing after being posted on social media and blogs. I don't know what the motive for removing the tiles is, but I only hope whoever has them will consider doing something with them so other people can also see and appreciate them. This is the first reappearance by the Toynbee Tiler in a long time, right? Why do you think he/she came back? It's not the first appearance in a long time — but they took a hiatus in Philadelphia for a number of years. I have no idea for the reasons behind the hiatus, but I'm glad they're back. Without naming names, are you pretty sure you know the identity of the Toynbee Tiler? Have you met him/her yet? Yes, I'm pretty sure. I've met the creator of the House of Hades tiles but not of the originals, which inspired the art form, and who made this new batch. I doubt that will ever happen, and I'm fine with that. Photo of a newer tile found downtown. 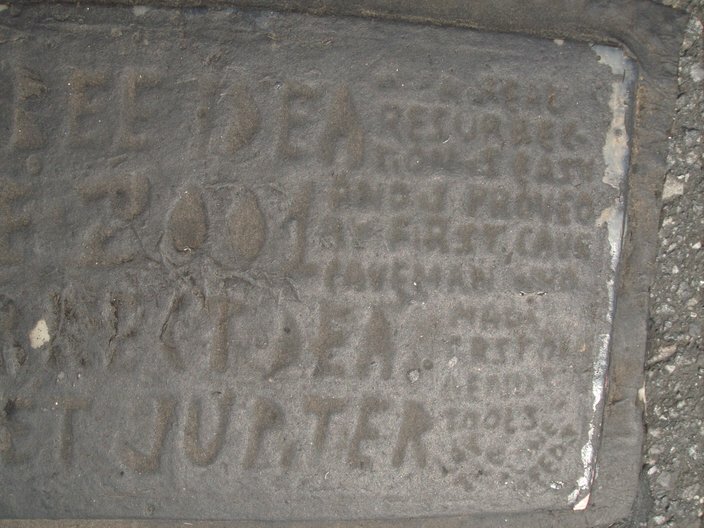 The unknown artist is believed to cover his pieces in tar which then wears away over time, revealing the tile. How has your life changed since the ‘Resurrect Dead’ movie? Not in any significant way. I still work the same job and do mostly the same things day to day. It may have given a slightly higher profile to my artwork, though that hasn't translated to big art sales or anything of the like. Every once in a while, someone will recognize me from the film. Tell me about the book you’re working on. What’s it about? The book is a biography and art collection of an artist named Herbert E. Crowley. I've been researching and compiling it since 2010. When I began, there was not a scrap of information about him to be found, aside from the book of forgotten comic strip artists in which I initially encountered his work. I've since uncovered an incredible array of material, which I can't wait to share with the world. I spent two weeks in Zurich with his niece and have traveled around the globe following every trace of him I could find. He was an opera singer who suffered from stage fright, a sculptor, a set designer and a cartoonist in the early to mid-1900s. He exhibited in the famed 1913 Armory Show, and his wife, Alice Lewisohn, along with her sister, Irene, was responsible for the 'off-Broadway' tradition in New York. He traveled the world and was connected with many intellectual and artistic luminaries, including C.G. Jung, who said his work 'illuminates the sympathicus and multiple luminosities of the collective unconscious.' After serving in the British camouflage division in World War I, he never exhibited his work in public again and disappeared from the public eye. Photo of another newer tile found downtown. We're not going to say where, since people like to “steal” them for themselves. But if you bike/walk around Center City, you might spot one.